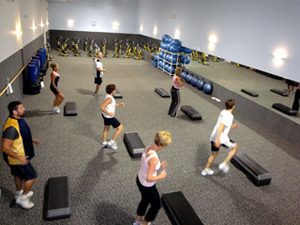 We offer FREE Group Fitness Classes to our members! These classes offer something for everyone. Choose from a line-up that will challenge you aerobically, plus strengthen and tone. Condition your body from the inside out with mindful fluidity in one of our Pilates classes. All classes are co-ed and multi-level. Join certified instructors and experience the excitement of Group Fitness Classes at Cutting Edge! Child Care is available for your convenience. ABS-N-CORE Get to the core with abs and more! 20 minutes is all you’ll need for this core challenge. BARBELL BLAST This compact barbell workout is sure to challenge ALL fitness levels. You will be taken through a total body workout using barbells to strengthen & tone all muscle groups. with short bursts of cardio. You’ll get a fun and complete body workout in just one hour! mentally & physically. You can expect circuit-type classes with pyramid training to keep you on your toes! can improve your memory. Make the commitment to embrace your future and age well! to keep you from getting bored. thrown in throughout. Get ready for a major calorie burn! DANCE FUSION Dance your way to fitness! This aerobic class fuses popular dance styles such as Jazz, Latin, Country-Line, and Hip-Hop. Come and get your groove on! be out on the gym floor but still want to be active and have fun. GLUTES, GUNS & GUTS Sculpt the area that you really want to target in this creative, chiseling challenge. Move from lower body into core and then upper body with transitioning combos using a variety of equipment. loss or that love high intensity cardio. Major calorie burner! I AM ... DETERMINED Focus on functional fitness, core strengthening, and simple cardio drills. INSTRUCTOR’S CHOICE This class will challenge you with any one of our classes listed except Indoor Cycling. ball to improve core stability, strength and balance. Please bring a yoga mat. sweat-dripping fun of playing the drums. Please bring a mat for floor work. SILVER SNEAKERS CLASSIC A variety of exercises designed to increase muscular strength, range of movement and activities for daily living. Hand held weights, elastic tubing with handles, and a Silver Sneakers ball are offered for resistance. A chair is used for seated and/or standing support. SILVER SNEAKERS CIRCUIT Combine fun with fitness to increase your cardiovascular and muscular endurance power with a standing circuit workout. Upper body strength work with hand held weights, elastic tubing with handles and a Silver Sneakers ball is alternated with non-impact aerobic choreography. A chair is offered for support, stretching & relaxation. SILVER SNEAKERS YOGA This class will move your whole body through a complete series of seated and standingYoga poses. Chair support is offered to safely perform a variety of poses designed to increase flexibility, balance, and range of movement. Restorative breathing exercises will promote stress reduction. SOFT PILATES Prepare to enjoy the “Softer Side” of Pilates. Sitting & standing movements with chair assistance offers muscle balance, alignment, core strength and deep breathing. Exercises will be assisted with balls, light weights and soft bands. All fitness levels invited. Music sets the mood too! Please bring a yoga mat. through various poses, you will strengthen your muscles as well as challenge them to become more flexible. followed by boot-camp style strength training to target all muscles. circumstances are beyond our control. ©2008-19 Cutting Edge Health & Fitness, All rights reserved.